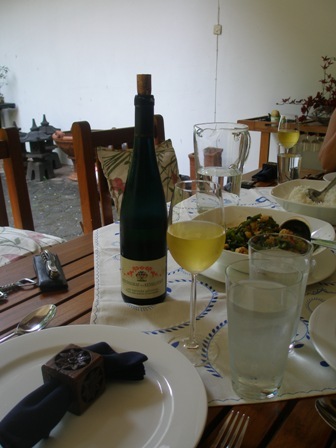 The Riesling wines I selected for Sunday lunch were just the right complement to the Asian food we were having for the last joint family lunch in our Jakarta home. Tomorrow our girls will be laving for Bangkok to attend the opening of the new school year at their new school. The lunch consisted of a typical Indonesian composition of Kankung (a green water vegetable) with prawns. We ate it with rice using spoons and forks only as it is the custom in Indonesia. 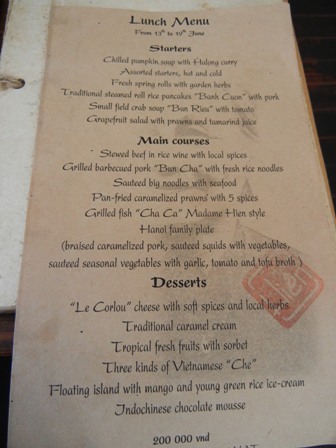 The wine we had with the meal was of course not an Asian invention but a Celtic one. The semi-dry Riesling (“Feinherb” as the Germans say) from the Saar was a perfect match for the food. We had the last bottle of ‘2003 Wiltinger Gottesfuss Riesling Kabinett Feinherb’ , (alc. 11% vol.) from Reichsgraf von Kesselstatt in Trier (www.kesselstatt.com). The spicy food was just the right dish to have with this Riesling wine from my home region. The sun was shining, my garden green and lush despite the dry season, and so 10 years came to a beautiful end for the four of us. 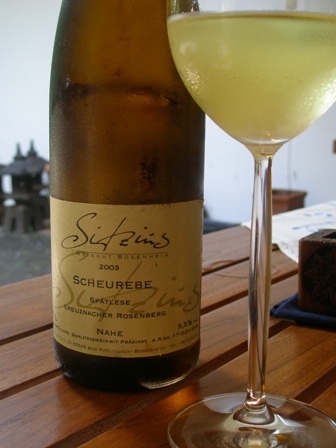 PS: As “dessert” we had a second bottle of German wine (which was also the last one in my possession), one coming from the Nahe wine region where my grandfather used to live, ‘2003 Sitzius Kreuznacher Rosenberg Spaetlese, Scheurebe’ (with only 9.5 alc./vol.) from Weingut Alfred Sitzius in Kreuznach-Bosenheim (www.weingut-sitzius.de). The variety is mainly found in Germany and Austria and produces highly aromatic wines often made into sweet wines but also available in its dry incarnation. It shows honey, blackcurrant and grapefruit flavors but retains also some of the Riesling character, though it is less acidic, in short beautiful wine can be produced from this grape variety. This entry was posted on Sunday, August 17th, 2008 at 5:15 pm and is filed under food and wine. You can follow any responses to this entry through the RSS 2.0 feed. You can leave a response, or trackback from your own site. homesick feelings occured, when I read about your wines from Trier and Bad Kreuznach. Acctualy, my homesickness cannot be that severe, because the last weekend, I spend two wonderfull days with my cousin Uli (you know him from the Bagatelle-Event): we had a big winetasting at Karthäuserhof (Trier-Eitelsbach) where we could not resist, two buy all the 120 bottles left of 2005 Riesling Kabinett (not the dry one), that nobody wanted to have (exept us). Its crazy, the run on the dry-riesling wines (but only them from the recent vintage) is like a goldrush. A bargain for those people like me, that prefere ripe and off-dry and sweet rieslings. The next day, we had another winetasting in Konz at von Othegraven. Needless to say, that they have amazing saar-rieslings. Leaving the home region was rather cruel (nothing compared with your feelings, I suppose). But … the next weekend, we have the “best of riesling 2008” event in Münster, I will report.